For most people a full moon viewed just over the horizon appears to be 1.5 times larger than when it is viewed at its zenith – i.e. when it is directly overhead. Since the moon’s orbit is circular it is the same distance from Earth whether viewed just over the horizon or directly above. If the moon is photographed with a camera adjusted to the same settings it will appear to be the same size in pictures regardless of its location in the sky. Visual cues presented on the horizon – buildings, trees, hills etc. – are not necessary since the same effect is observed on the ocean where there are no landmarks. The same illusion is observed for other celestial objects like the sun and constellations. For some reason observing an object just above the horizon, as opposed to having empty space as the backdrop, makes it appear larger. Scientists who have investigated this optical illusion have gained some understanding as to the mechanisms of visual perception but they still do not have a unified explanation for the phenomenon. The references cited below each describe some of the facets of this intriguing mystery. This rare “upside down rainbow” was photographed by an astrophysicist in Great Britain. The technical name for this unusual phenomenon is circumzenithal arc. The arc only appears when sunlight shines at a specific angle through a thin patch of cirrus clouds at a height of 4 to 5 miles. At this altitude the clouds are composed of crystals of ice about the size of salt crystals. They have to be perfectly aligned with the sun in order to produce the prism effect that results in the unusual display. Geodes are rock formations that contain crystals. In 2000, a giant geode measuring 26 feet high was discovered in a silver mine in Spain. The crystals are about three feet long and are so transparent that you can see right through them. They are composed of gypsum which is the ingredient of plaster of Paris. The Naica Mine of Chihuahua, Mexico has deposits of lead, zinc and silver. It is also known for its extraordinary crystals. In 1911, the famous Cave of Swords was discovered 400 feet beneath the surface. Since it was such a treasure trove of brilliant crystal deposits it was decided to preserve the cave for future generations. 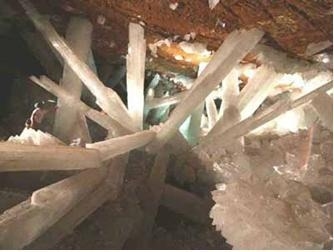 In 2000, at a depth of 1,000 feet beneath the surface, an even more spectacular discovery was made: giant gypsum crystals over 30 feet long that weigh several tons each! The Giant Cave of Crystals can be visited for only a few minutes at time though due to the pervasive, intense heat. Hopefully more discoveries will be made in this enchanting kingdom of scintillating natural beauty. Around the Black Hills of the Dakotas large sheets of mica and spoduomene – a valueable source of lithium are mined. The largest spoduomene crystals were over 60 feet long. Since they were large enough to resemble tree trunks the miners called these giant crystals spod logs. Ever see a car roll uphill? There are 45 locations in the United States where a car left in neutral, with the brakes off, will roll uphill. Likewise, poured liquid will spill uphill at these mysterious locations. The United States is not the only country where this strange behavior occurs. So called anti-gravity hills, or spook hills as they are sometimes called, have been found in Australia, Italy, Canada and Greece. A famous spook hill is located in Bedford County, Pennsylvania. Here is a picture of it looking downhill. The start point is at the bottom of the hill and the end position is located at the top. Surveyors, using sophisticated GPS equipment, determined that the elevation at the end position was 1,569 feet and the elevation at the start position was 1,582 feet. The downward slope seen in the photograph is only an illusion. What appears to be at the bottom of the hill (where the starting point is located) is actually at a higher elevation. When the vehicle rolls from start to end it is actually rolling downhill even though it appears to be running uphill. All of the spook hills investigated to date have the same trait: somehow the surrounding terrain creates an optical illusion that a vehicle is rolling uphill when in fact it is proceeding downhill. The position of the moon relative to Earth determines the ebb and flow of tides. Now scientists have determined that the effect of the moon goes far beyond the seashore. Evidently the moon also has an effect of water flow in trees since the diameters of tree stems expand and shrink in accordance with the position of the moon in the sky. If tides occur twice a day, so do the swellings and contraction of trees. These curious tidal patterns are observed even when the trees are kept in darkness and at constant pressure and humidity. Even more intriguing, chunks of tree stems that are sealed to prevent water from flowing in or out will still expand and contract according to the lunar cycle as long as the cambium, the active growing region, survives. The expansions and contractions are small -- only tenths of a millimeter, but even these seem too large, considering the weakness of the moon's gravitational field on Earth. Earthquake lightning is a natural but highly unusual phenomenon where luminous appearances associated with active tectonic regions have been observed. Lights were photographed in Japan during a month-long earthquake swarm in the mid-1960s. Lights were often seen before and after the 1995 earthquake in Kobe, Japan. Observers positioned in fire lookouts on the Yakima Indian Reservation, Washington reported from 1972 to 1977, with eyewitness accounts and photographs, bands of nocturnal lights which correlated with earthquake activity. The lights were reported as near ground level and appeared to be spherical. They were described as white to orange in color. One of the most intriguing reports of earthquake lightning comes from Canada. From late 1988 to 1989 in the Saguenay region of Quebec there was prolonged earthquake activity. Eyewitness reports, later published in peer-review science journals, describe fireballs - a few yards in diameter - popping out of the ground in a repetitive manner. Others were observed several hundred yards up in the sky either stationary or moving. Two fire-tongues were also observed on the ground. The colors identified were green, orange, yellow and white. Some of the lights lasted for over ten minutes. In August 2007 a deadly 7.9 magnitude earthquake struck in Peru. During the cataclysm individuals videotaped flashes of white light that momentarily lit up the horizon. From the air forest rings appear as mysterious light - colored rings of stunted tree growth found in the boreal forests of Canada. On the ground you could walk right past them totally unaware of their existence. They range in size from 30 yards to half a mile in diameter. Over 2,000 of these forest rings have been documented, but scientists estimate the actual number is more than 8,000. What causes these mysterious circles of the northern forests? One scientist has provided remarkable evidence suggesting that forest rings are caused by giant, naturally occurring electrochemical cells, i.e. huge natural electrical batteries with a negative charge in carbonate soil and surrounded by oxygen that carries a positive charge. Small currents from the batteries travels outward in a circular pattern and where it meets the positive charges in carbonate – based soil, acidic conditions are created that erode the carbonate soil, causing it to drop in a circular depression around the natural battery. If you could record the position of the sun in the sky each day at the same time for one year you would see that the sun would trace out a path that resembles a tilted, and somewhat distorted, figure ‘8’. This is called an analemma. · The Earth is tilted on its axis 23.5° in relation to the plane of its orbit around the sun. ·The Earth does not orbit the sun in a circle, but in an ellipse. The sum of these two effects causes the analemma. 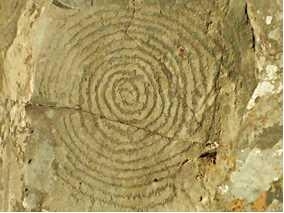 On the Canary Islands on May 2008, archeologists discovered a piece of stone, roughly 20 by 14 inches, that featured a circular spiral etched on its surface. They called it a cosmic clock. According to a report by Tenerife News, the stone was found on Cabeceras de Izcagua in La Palma, at a height of over one mile. Scientists believe the stone was used in conjunction with the alignment of three piles of stones on a facing mountain, to determine when the fall and spring equinoxes occur. Strangely enough that mountain is still associated with sky-watching since the Roque de Los Muchachos is the site of a world famous observatory houses one of the world’s largest telescopes. The news report describing the mysterious “cosmic clock” rock from the Canary Islands gets even more intriguing when one considers that similar petroglyphs were used by Indians of the American Southwest to mark important celestial events. The most famous, and well studied, is the petroglyph of the Anasazi Indians who inhabited Chaco Canyon for almost a thousand years, from 400 to 1,300 A.D. before they disappeared. 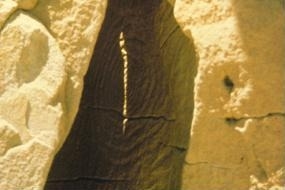 The petroglyph was discovered on an isolated butte in New Mexico in 1977 (shown in the picture below). The amazing astronomical sophistication of these ancient Americans is revealed with the concentric spiral petroglyphs they carved into the face of a cliff and then covered with stone slabs arranged so that only sharp slivers of sunlight fell upon the spirals. The exact position of the sliver of light naturally depends upon the location of the sun in the sky which in turn changes with the seasons. Incredibly, the Anasazi constructed their physical calendar so that on midday of the summer solstice the sliver of light shining through would form the image of a dagger bisecting the spirals. This amazing phenomenon is shown in the picture below. The winter solstice and the equinoxes are also registered by unique sun dagger displays on the carved spirals. It is also possible that the Anasazi’s also had knowledge of the 18.6 year lunar Metonic cycle. There are two very shallow grooves that cross the petroglyph, grooves associated with the movement of the moon over the 18.6-year Metonic cycle. When a full moon rises at its maximum northern extent, it will cast a light shadow line directly down the upper groove. 9.3 years later, the moon will rest at its southern maximum position and will cast a different light shadow line through the center shallow groove. Normally methane is a gas. 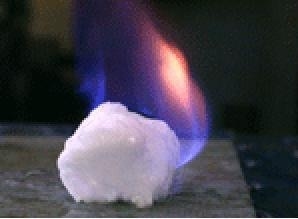 When subjected to very high pressure methane gas, together with trapped water molecules, can form an unstable solid structure called methane hydrate, or fire ice. Great quantities are found underneath the ocean floor. Cores extracted from the Blake Ridge off the Carolina coast confirm the immense quantity of gas precariously locked up in deep sea-floor sediments - enough gas is there to supply the U.S. for more than 100 years. Unfortunately due to its instability – any sudden force may disrupt the solid compound and release methane gas – there presently is no way to mine this vast resource. In fact there may be places along the ocean floor where solid fire ice is particularly unstable and can serve as a source for a chaotic and sudden release of massive quantities of methane gas from the ocean floor. Massive quantities of methane gas bubbling toward the ocean surface would escape into the atmosphere. It is possible that enough methane gas may be released to reduce the buoyancy of the water – and air – thereby accounting for the disappearance of ships and aircraft. Intermittent natural gas blowouts from hydrate-associated gas accumulations, therefore, might explain some of the many mysterious disappearances of ships and planes – particularly in areas where deep-sea sediments contain large amounts of gas in the form of hydrate. This may be the circumstance off the southeast coast of the United States, an area noted for numerous disappearances of ships and aircraft. On December 2, 1942, at Stagg Field, in Chicago, the first human built nuclear reactor went critical and sustained nuclear fission - an event that was hailed as a triumph of human intellect. But there is an even more interesting story to tell. It turns out that nature already beat Enrico Fermi and his colleagues by 2 billion years. In 1972, scientists discovered that at the uranium mines of Oklo and Bangombe, in the African Republic of Gabon, some 17 natural nuclear reactors underwent nuclear fission. The Gabon reactors were discovered when the French found that uranium ore from Oklo contained anomalously low concentrations of the fissionable isotope Uranium 235 as well as fission products. Excavation work uncovered small pockets where natural fission had occurred billions of years ago during the Precambrian period. My wife and I saw a puzzling sight in October 1994, in the Mekong River near Nongkhai, Thailand, during a full moon, in the evening. Lights appeared under the water for a few hundred meters along the Mekong River. They rose from the bottom of the river and floated to the surface, then shot like missiles into the sky and out of sight. They were the size of beach balls, and many flew out of the water every few minutes, surfacing about 10 meters apart. I am told that this happens every year at the same time. Locals say it is caused by a serpent releasing her eggs. Does anyone know of this phenomenon? The usual explanation of marsh gas self combustion doesn’t hold since the lights were first observed underwater. These ephemeral luminous displays occur only during the October full moon and last only about 30 minutes. The lights rise out of the river and sometimes nearby rice paddies, but only along a small stretch of the river close to the Thailand-Laos border. In Report #6 we described eye-witness accounts published in the peer-review journal Nature of basketball – size lights emanating from the ground during seismic activity. In spite of legendary tales, most likely apocryphal, no one has found an elephant graveyard – places in Africa where old elephants trek alone to die; although piles of elephant bones have occasionally have been found. Other sites in Africa contain the remains of small mammals and birds which apparently died from asphyxiation. Natives attribute these deaths to mazukus which means “evil wind” in Swahili. When investigated the sites of death are usually found to be in low-lying areas where carbon dioxide accumulates in sufficient concentration to extinguish the flames of kerosene soaked rags. In 1984 and 1986 there were two catastrophic events where carbon dioxide killed hundreds of humans and thousands of cattle in Cameroon, Africa. 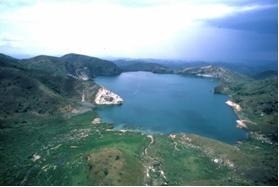 On August 21, 1986, a limnic eruption occurred at Lake Nyos which triggered the sudden release of a huge cloud of carbon dioxide that spilled over the northern lip of the lake into a valley displacing all the air and suffocating some 1,700 people within 16 miles of the lake, as well as 3,500 livestock. One of the Lake Nyos victims. On August 15, 1984 inhabitants of the village of Njindom, Cameroon heard a loud explosion coming from Lake Monoun. Early the next morning, authorities found 37 bodies along a 200 yard stretch of road by the lake. Blood was oozing from the noses and mouths; the bodies were rigid; first-degree chemical burns were present. Many animals and plants along the shore had been killed. The exact cause of the carbon dioxide gas release at Lake Nyos and Lake Monoun is still unresolved. In 2001 an attempt was made to degas Lake Nyos using giant vertical pipes embedded into the bottom of the lake. Although ordinary lightning accompanies many tornadoes observers have reported other types of strange luminous displays, particularly with nocturnal tornadoes. Green spikes of light have been reported, as well as an orange glow. Other descriptions include a beautiful blue light surrounding the twister accompanied by balls of orange light. The lightning associated with these luminous tornadoes is also unusual sometimes producing a whole spectrum of colors: red, blue, green as well as the usual white. No one understands what causes these sometimes vivid visual displays. In fact no one really understands what causes tornadoes which occur primarily, though not exclusively, in the United States and southern Canada. Our topic series Archeology and Ancient Mysteries features two basalt related stories reports: Report #2 describes how ancient Mesopotamia cultures synthesized their own basalt and Report #3 describes the equally incredible account of how prehistoric inhabitants of Micronesia quarried mega-ton columns of basalt and somehow transported them long distances to build an artificial island complex called Nan Madol. This report takes us to the coast of Ireland where for centuries people have marveled at the majesty and mystery of what has come to be known as Giant’s Causeway. Giant’s Causeway in Northern Ireland is an ancient lava bed (basalt) that consists of a stunning array of precise columns which are polygonal in a horizontal cross section. These columns, which seem to march into the sea, occupy several miles of coastline. You can’t blame the original inhabitants for believing that they must have been shaped by some giant madman with a hammer and chisel. Nonetheless the formations are natural. The question that scientists have spent 300 years trying to answer is how molten lava formed repeating structures with such remarkable geometric precision. The mystery was solved when geophysicists deviated from studying magma and basalt and instead experimented with cornstarch and water. A mixture of water and corn starch cracks as it dries out and forms very similar columns to those found at Giant’s Causeway. By carefully controlled the drying process a complex mathematical relationship between the size of the columns and the speed with which the drying front moved was formulated. Scientists were able to apply this information to studying the precise geometry of basalt columns that, over a long period of time, cooled from molten lava. 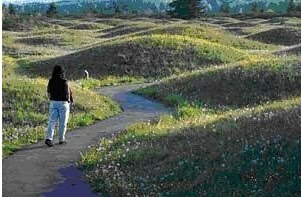 Millions of Mima Mounds are scattered across the landscape west of the Mississippi, from British Columbia south to northern Sonora, Mexico. They are also found in Africa and South America. The mounds are composed of soil and small stones and typically are about six feet high, with diameters of 60 feet. The mystery is no one really knows how they are formed. Some scientists advocate that gophers have played a role in forming the near circular mounds. Other scientists, noting that when dirt that is evenly applied over the surface of plywood will form small clumps when the wood is vibrated, stress that seismic activity is mainly responsible. Regions where the mounds are common have been seismically active in the past. However the rodent theory was reinforced in 1984 when Mima mounds were discovered in Kenya. Field investigations indicated the mounds were constructed from dirt immediately surrounding them. In short, the African mounds, and probably those of North America, may be the products of diligent rodents. Many miles south of Cairo and west of the fertile Nile valley are mysterious deposits of yellow-green glass strewn among the sand dunes of the Libyan Desert. 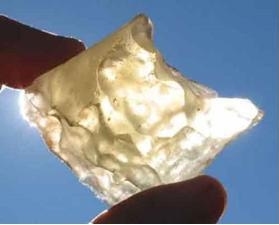 This Libyan Desert glass (LDG), as the substance has been named, was accidentally discovered in 1932 by Patrick Clayton, a geologist who was conducting a survey of the Egyptian desert. While driving about among the dunes near the Saad Plateau his jeep crunched over a piece of glass. The fragments of glass that Clayton carried back with him have mystified and intrigued geologists for decades. LDG is the purest natural silica glass ever found. There is nothing else, geologically, quite like it. The glass is a scientific enigma. How did it get to be there and who or what made it? When pure, the yellow-green glass has a gem-like quality. Two geologists once spotted a sample of Libyan Desert glass among the jewels of King Tutankhamen at the Egyptian Museum in Cairo. The jewel had previously been classified as chalcedony, a type of quartz. Tutankhamen’s Pectoral with desert glass scarab. The first atomic bomb detonation, at the Trinity site in New Mexico in 1945, created a thin layer of glass on the sand. But the area of glass in the Egyptian desert is vastly bigger and so are the shards of glass. An Austrian astrochemist, Christian Koeberl, had established that the glass had been formed at a temperature so hot that there could be only one known cause: a meteorite crashing into Earth. And yet there were no signs of a suitable impact crater. Even pure LDG contains tiny bubbles, along with white wisps and inky black swirls. The whitish inclusions consist of refractory minerals, such as cristobalite. The ink-like swirls, however are rich in iridium, a substance that is rare on planet Earth but commonly found in meteorites. The iridium content suggests that leads the immense amount of widely dispersed shards of glass were created during the searing, sand-melting impact of a cosmic projectile. But where is the crater? The mystery was solved in 2006 when scientists at Boston University Center for Remote Sensing found satellite evidence of a large impact crater in Egypt’s western desert. The sheer size of the crater as well as wind and water erosion kept it hidden. In Tasmania, near Mount Darwin, shards of a similar glass material, Darwin Desert Glass, exist. A potential crater has been identified. At 7:17am on 30 June 1908, an immense explosion devastated the forest of central Siberia. Over 60 million trees were toppled covering an area of 800 square miles near the Tunguska River. The blast was 1,000 times more powerful than the atomic bombs dropped on Hiroshima and Nagasaki and generated a shock wave that knocked people to the ground 30 miles from the epicenter. Witnesses claimed that an immense fireball streaked across the sky at an oblique angle. The effects of the blast were experienced far into Europe and Central Asia. Some people saw massive, silvery clouds and brilliant, colored sunsets - others observed bright, luminescent skies at night; in Britain many people could read their books and magazines after sunset without the benefit of artificial lights. Assuming a cosmic projectile was responsible for the massive devastation the question becomes what kind: a meteorite, a comet or an asteroid? Also there’s the matter of the impact crater – where is it? In 2007 scientists from the University of Bologna claimed to have a discovered a potential candidate. Using three dimensional sonar imaging they determined that Lake Cheko, located five miles from the epicenter of the blast, has a funnel-shaped configuration possibly indicative of a spectacular impact event. The Lake was first examined in 1960 but since then superior technology has provided much better resolution. The scientists also detected an area of greater density beneath the lake which could be the remains of the space object that impacted with Earth. During the long intervening decades of investigation many scientists felt that a comet – being made up mainly of water – was too fragile to survive the plunge through Earth’s atmosphere. Nonetheless one theory held that the Tunguska object was a fragment of Comet Encke. This ball of ice and dust is responsible for a meteor shower called the Beta Taurids, which tumble into Earth's atmosphere in late June and July – matching with the time of the Tunguska event. In 2009 the comet theory gained credibility from researchers at Cornell University. The pieces of the puzzle involve the space shuttle, an unusual type of cloud called noctilucent cloud and some unexpected physics. 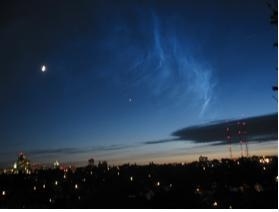 Night-time or noctilucent clouds are the highest clouds in the Earth's atmosphere. They are found almost at the edge of space at 50 miles from Earth where they are positioned to sometimes illuminate the night sky by reflecting sunlight after the sun has set beneath the horizon. They are usually encountered close to the poles and at latitudes from the equator between 50° and 70° north and south of the of the equator. It's totally new and unexpected physics. 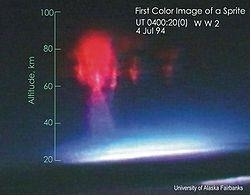 Similar clouds were visible at night long after the Tunguska event. Having found a mechanism for the transport of water over vast atmospheric distances, leading to the formation of noctilucent clouds, the Cornell physicists suggest that the bright night skies observed after the Tunguska event could be explained by a great deal of water being released into the upper atmosphere. This is consistent with the notion that the space object was a comet that shed its icy outer layers before slamming into Earth, rather than an asteroid or meteoroid. How vulnerable is Earth to flying space objects? Giant meteorites have been suspected of playing a role in triggering mass extinctions throughout various geological eras. The Tunguska catastrophe is a stark reminder of the kind of power packed by a relatively small space object. In 1932 a similar, but smaller, Tunguska – like event occurred in the remote jungles of northern Brazil. On January 18, 2000 a bolide streaked across the sky in the Yukon and then exploded. The sonic booms startled residents as far away as British Columbia and Alaska. On March 9, 2000 a bolide in northeastern Arkansas touched off intense forest fires when it exploded and crashed. 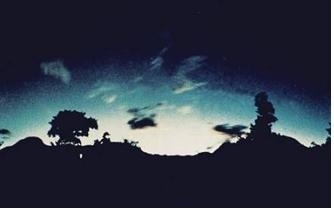 On April 15, 2010 a massive fireball streaked across the skies of Missouri, Illinois, Indiana, Wisconsin and Ohio. Reports of a prolonged sonic boom with subsequent shaking of trees and houses accompanied the event. Click here to see a video of this huge bolide lighting up the sky. Occasionally, young, healthy hikers are discovered lying dead in the mountains without a clue as to what killed them. Perhaps they were killed by lightning – but they were not struck by lightning. Most deaths from lightning are from direct strikes, side flashes, or ground currents. The ground currents typically kill by passing up one leg and down the other. Cows sheltering under trees are even more susceptible than humans because they have four contact points. (In the topic series Unusual Phenomena Report #1 describes – with photo - the lightning death kill of over 50 cattle.) People and animals electrocuted this way bear burn marks and other clues pointing to the cause of death. The cornea in their eyes is often times cooked. As for those "mysterious mountain deaths," scientists at the Lightning Data Center, Denver, suggest that these unfortunate individuals may have been zapped by magnetic fields. Lightning strikes can create electrical currents as high as 100,000 amperes in surrounding rocks and soil. These, in turn, create intense magnetic pulses that induce small electrical currents in nearby objects, such as hikers. Although small, these internal currents are sufficient to trigger lethal ventricular fibrillation without leaving forensic clues. After existing for 5 billion years the home that we call Earth is still active and violent. Five hundred active volcanoes scattered across its surface produce an eruption, on average, every two weeks. Everyday multiple earthquakes rattle the planet. Since the 1960s tsunamis have plowed across the Pacific Ocean with an average of one tsunamis per year. The atmosphere is just as active. 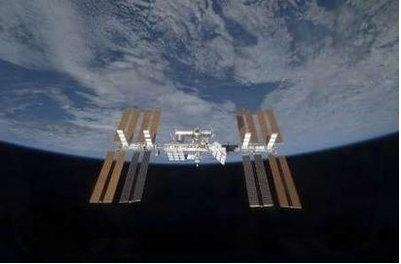 Every year thousands of tons of space dust are harvested. From June until December giant hurricanes race across the Atlantic. Giant sandstorms the size of Spain can blow dust from Africa to Florida. At any moment over a thousand electrical storms are in progress. On average Earth is struck by lightning a 100 times every second. Now a lightning researcher at the University of Bath has discovered that during thunderstorms, giant natural particle accelerators can form 25 miles above the surface of the Earth. The phenomenon occurs when intense lightning discharges collide with cosmic rays from outer space. The powerful cosmic rays knock electrons out from neutral air molecules. The freed electrons in turn are violently accelerated upward by the negative electric field associated with the lightning. Remarkably the accelerated electrons form a well focused particle beam that emits radio waves which scientists use as a tool to measure how up the particle beam extends. They have determined that some of them reach all the way into near-Earth space where the energetic electrons become trapped in the Earth's radiation belt. Subterranean fires are much more difficult to extinguish than above ground fire events. Underground coal seams can spontaneously catch fire and burn for decades or, in the case of Burn Mountain in Australia, even thousands of years. In China, the world’s largest coal producer, underground coal fires are a serious problem. Coal fires extend over a belt across north China where over one hundred major fire areas are active. Some of the largest ones having been burning for over 50 years. In the United States, there has been over 45 mine fires burning across Pennsylvania with five underground fires in Allegheny County, five in Percy County, one in Westmoreland, and others in more isolated areas. The most famous fire occurred in the mining town of Centralia located in the anthracite coal region of Eastern Pennsylvania. It began in 1962 and continued throughout the 1970s and 1980s eventually forcing the community into a ghost town. Today it resembles a post-nuclear war zone where much of the ground is too hot to walk on. Underground gas fires are even more catastrophic since they burn much more intensely than typical smoldering coal seam fires. In 1966 the Soviets resorted to a nuclear device to extinguish an underground gas fire that raged out of control for over three years. During the 1970s nuclear devices were deployed several more times in a last ditch effort to control underground gas mine fires. Evidently intense heat from the nuclear blast forms a glassy surface on the subterranean substratum that helps to suffocate the fire. 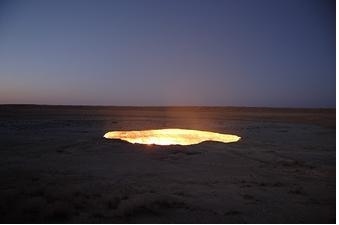 The Derweze area of Turkmenistan is rich in natural gas. While drilling in 1971 geologists accidentally found an underground cavern filled with natural gas. The ground beneath the drilling rig collapsed, leaving a large hole. The workers deliberately ignited it so that no poisonous gas could escape. It has been burning steadily ever since. No one knows how many tons of natural gas has wastefully burned over the decades but, so far, there seems to be an infinite supply down there. The locals call the fiery pit The Door To Hell. On December 9, 2009 sometime between 7:50 A.M. and 8:00 A.M (just before dawn) a remarkable, spiral apparition appeared over Norway's northern skies. A similar, though less spectacular event had also occurred in Norway the month before. Both events were attributed to visual features of failed flights of Russian Bulava sea-based ICBM missiles. It was later confirmed that the Russian Navy submarine, Dmitry Donskoy, was in the White Sea and was preparing for the 12th test launch of the Bulava missile, which has had numerous failures. Of the missile's 11 previous launches since 2005, six have been failures. Just how would a missile be able to create a spiral with perfect symmetry? Dr. Jonathan McDowell, an astrophysicist at the Harvard-Smithsonian Center for Astrophysics in Cambridge, Massachusetts, suggests the failure occurred well above the atmosphere. If it had occurred at lower altitudes, atmospheric drag would have caused the missile to fall quickly to Earth, creating a downward-pointing corkscrew pattern whose contrails would have been blown helter-skelter by the wind. The Bulava missile has three stages that fire in succession as it climbs up in altitude. Most likely the problem occurred in the third stage. The third stage's nozzle, which directs the rocket's exhaust plume, may have fallen off or been punctured, causing the exhaust to come out sideways instead of out the back. The sideways thrust sends the rocket into a spin, spewing flame as it goes. Dr. McDowell has stated that, “If thrust was terminated right away, then you wouldn't see the spiral. The unusual thing this time is that the missile was allowed to carry on firing for a bit after it went wrong." A computer simulation on YouTube demonstrates how the spiral cloud seen over Norway may have been formed. Since the event occurred at high altitude just before dawn, reflection from the sun on leaking fuel illuminated the phenomenon. The intense blue color is the result of solar fluorescence from aluminum oxide in the plume. Aluminum oxide is the chemical formula for sapphires, so what people were observing was sunlight scattering off lots of tiny sapphires. But why is the blue color in the form of a three dimensional corkscrew that seems to emanate from the center of the larger circular spiral cutting an almost perpendicular profile to the concentric circles? The preponderance of the evidence suggests that the spiral apparition was the result of a failed missile launch but not all aspects of the strange event have been explained. Between 1981 and 1985, hundreds of strange lights have appeared in a small valley in central Norway with strong recurrence. Named after the valley, the lights are known as The Hessdalen Phenomenon. A research station was set up in 1983. During January-February 1984, eight different kinds of instruments were used to analyze the lights and determine their cause. But no conclusions were drawn as to their origin. Of interest is that the lights were sometimes detected by radar. Other times radar observations were made but nothing could be seen with the naked eye. The frequency of occurrence has diminished to about twenty observations a year. Østfold University College still maintains a research station that occasionally issues a technical report but so far investigating scientists have not published their findings in a peer-review research journal.